We've seen an array of brands join the smartwatch party, with TAG Heuer and Michael Kors having entered the smartwatch race already. Well, Fossil is now ready to debut more luxury hybrid smartwatches with its Armani Exchange Connected hybrid smartwatches. This line of smartwatches, similar to those of Fossil's hybrid Q watches, mimic the look of luxury timepieces but outperform their "dumber" counterparts. With the new Armani Exchange Connected smartwatch line, the company has included features such as auto time (matches GPS time), second time zone viewing, alarms, music controls, wireless camera shooting, and sleep tracking, along with the usual app notifications. The Armani Exchange Connected smartwatches have six-month battery life, so you won't have to charge the devices as much as you would smartwatches in general (but keep in mind that you'll have to get the battery replaced every six months). Additionally, the Armani Exchange Connected watches can connect to either your Android-powered smartphone or iPhone as far as 84 feet away. These smartwatches are the very first smartwatches from Fossil to feature a silicone band as opposed to a leather or metal band found in its Q smartwatch lineup. 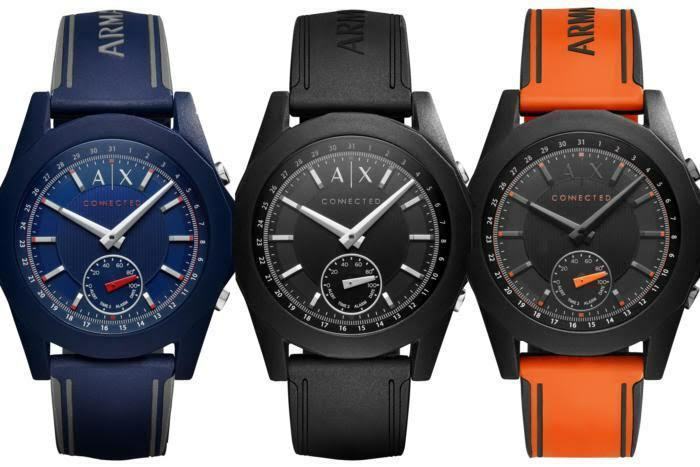 The Armani Exchange hybrid smartwatch, called the AX Connected, will come in blue, orange, black, and white, cost $175, and will be available at the company website in February.